United Kingdom | It's Only Natural To Resist. Apparently UK’s The Sunday Times published an anti-Israel cartoon on Holocaust day. 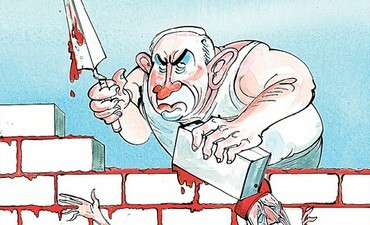 The cartoon seems to depict Israel’s prime minister, Benjamim Netanyahu, paving a wall with blood, the blood of Palestinians. The Holocaust was a terrible tradegy, it was. However, currently the Jews are doing to the Palestinians what was done to them. The Palestinians are experiencing their own Holocaust, therefore I do not find this cartoon to be offensive, not one bit. In fact, rather than being offensive, this cartoon speaks the truth. It shows how Benjamin Netanyahu is a hypocrite. His people endured pain and suffering during World War 2 and now he is inflicting the same, if not worse, pain and suffering among millions of innocent Palestinians. The only reason anyone would find this cartoon “offensive” is because it speaks the truth and they are denying the truth. Let us not forget that the Palestinians are suffering just as the Jews did. We learn about the Holocaust year after year in school, yet we never learn about the present day Holocaust occuring in Palestine. It’s time for some change. The British government has warned that the official authorisation of Israel’s first settlement university will create another hurdle in the peace process. Israel’s defence secretary, Ehud Barak, approved the upgrade of a college in the settlement of Ariel, 11 miles inside the West Bank, earlier this week. In a statement released on Thursday, the British foreign office minister Alistair Burt said the UK was deeply disappointed by the decision. “Ariel is beyond the Green Line in a settlement that is illegal according to international law. This decision will deepen the presence of the settlements in the Palestinian territories and will create another obstacle to peace,” the statement said. Burt repeated the government’s call for Israel to reverse a recent spate of settlement expansion plans, saying it should “take no further steps aimed at expanding or entrenching settlement activity”. A spokesman for the Israeli foreign ministry said it was “disappointing to see that a [UK Foreign Office] minister should adopt the contested Palestinian position hook, line and sinker, thus adding controversy where it is already in excess”. Britain and other European countries have become increasingly vocal in their criticism of Israel’s plans to build thousands of new homes in settlements in the West Bank and East Jerusalem. They say such expansion threatens the possibility of a viable Palestinian state. An internal analysis paper prepared by Israel’s foreign ministry has warned that the European Union may press for the establishment of a Palestinian state independent of negotiations in 2013. According to a report in Haaretz, the paper said: “A growing understanding can be seen in the EU of the ineffectiveness of the current process. European diplomats in Jerusalem have warned that 2013 could be the last chance for the creation of a Palestinian state. Officials at Israel’s foreign ministry are concerned about the country’s growing isolation internationally, but fear there is a gap between their position and the stance taken by Israel’s political leadership. Britain and other European countries will consider “further steps” if Israel refuses to reverse its plans for settlement expansion after a wave of diplomatic protests, the foreign secretary, William Hague, has told parliament. Australia and Brazil joined five European countries in summoning Israeli ambassadors to hear condemnation of plans to build thousands of settler homes and develop highly sensitive land east of Jerusalem. The Israeli announcement is seen as a direct response to the UN’s recognition of Palestine as a non-member observer state. In addition to last week’s announcement, which came within hours of the UN vote, Israel said on Tuesday it would proceed with two more construction programmes in East Jerusalem. One plan, for 1,600 homes in Ramat Shlomo, caused a major diplomatic crisis when it was originally announced, during an official visit by the US vice-president, Joe Biden, in the spring of 2010; the second planned expansion, of 2,600 homes in Givat Hamatos, will further impede access between Jerusalem and Bethlehem. Despite international fury over the proposals, Hague suggested that economic sanctions against Israel were unlikely. He said: “I don’t think there is enthusiasm … about economic sanctions in Europe on Israel. I don’t believe there would be anywhere near a consensus, nor is that our approach. We continue to try to bring both sides back to negotiations. After the UN recognition, the Palestinians are entitled to apply to join other international bodies, such as the ICC. This was one of the major reasons behind Israel’s objection to the move. The Palestinian envoy to the UN, Riyad Mansour, wrote to the UN secretary general, Ban Ki-moon, warning that Israel “will be held accountable and will have to bear the consequences of its violations and obstruction of peace efforts”. Israel was behaving “in a rogue, hostile and arrogant manner, contravening all principles and rules of international law and reacting with contempt to the will of the international community”, the letter said. The government spokesman Mark Regev said Israel was “responding in a very measured way to a series of Palestinian provocations”. All Israeli settlements in East Jerusalem and the West Bank are illegal under international law. RT – International criticism has been mounting against Israeli plans to build new settlements. The UK and France summoned their Israeli ambassadors to get clarification and show disapproval amid reports of recalls. Other countries also spoke out. International reaction against Israel has been heated. Britain is reportedly considering a strong reaction to Israel’s plans and has summoned Israeli ambassador for talks over planned settlements, asking for clarification on the issue. However, conflicting reports say that Britain has denied consideration for recalling its ambassador to Israel. France and Sweden also consulted their ambassadors to Israel to decide on measures to show their disapproval. However, French President Francois Hollande says he does not want to impose sanctions on Israel. These moves come amid speculation both countries could recall their ambassadors. But France has reportedly downplayed recalling its Israeli ambassador, arguing there other ways to show disapproval. The three European diplomats who spoke to Haaretz indicated that London and Paris were coordinating their moves against Israel. “This time it won’t just be a condemnation, there will be real action taken against Israel,” a senior European diplomat said. The action, whatever it may be, could be implemented in the next few days. “London is furious about the E1 decision,” one of the diplomats said. According to the reports, Britain and France already informed the United States and other European countries, including Germany, of their intentions. International reaction was triggered after Israeli PM Benjamin Netanyahu ordered the construction of thousands of new homes in Jewish settlements in the area known as E1, between Ma’aleh Adumim and Jerusalem – a step widely seen as retaliation for recognition of Palestine as non-member state by the United Nations. 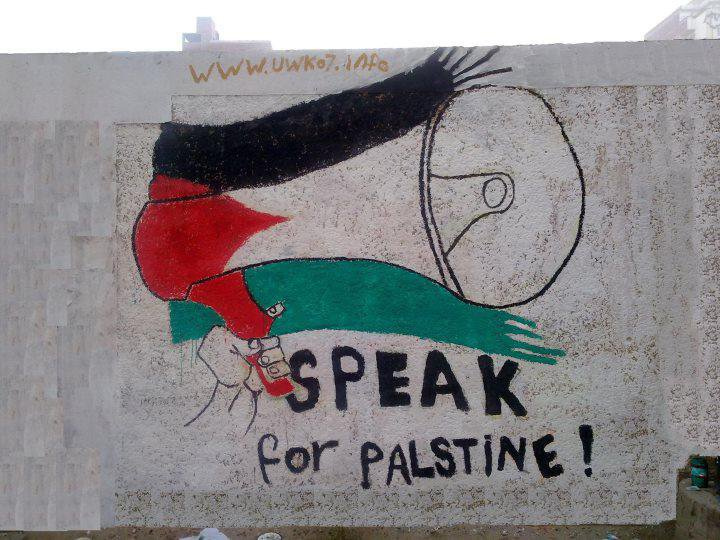 Israeli academic Miri Eisin disapproves of the UN’s recognition of Palestine. “The decision that was made on Thursday, from my point of view as an Israeli, was anti-Israel – not just pro-Palestinian. I want to see something that is a win-win situation. Something that goes toward an independent state – not just in rhetoric, not just in declarations – but in actuality. And to do so, Palestinians have to go back to the negotiation table. For the past four years, they have refused to do so,” Eisin told RT. The new settlements would completely cut off Palestinians in East Jerusalem from the rest of the West Bank, UN head Ban Ki-moon stated. Also Germany has joined in and asked Israel to refrain from proceeding with settlement building. “We appeal to the Israeli government to desist from this procedure,” German government spokesman Steffen Seibert said at a news conference. Swedish Foreign Affairs Minister Carl Bildt criticized Israel on his blog. “The Israeli government’s plan is pure vengeance against the Palestinians following the UN vote.Israel’s decisions to halt tax payment transfers and to extend illegal settlements around Jerusalem might dramatically escalate the situation,” he said. In addition, Turkey strongly condemned Israel’s plans and demanded to stop construction. “Israel’s illegal settlement activities intentionally deprive conditions of lasting peace in the region,” said a statement released by the Turkish Foreign Ministry. The Russian Foreign Ministry has also issued a statement saying it is very concerned with Israel’s plans and is asking Israel “to reconsider its plans regarding the new settlements and transfer the money to Palestine,” referring to the tax revenues collected by Israel on behalf of Palestinians. During the weekend, Israel canceled the transfer of US$120 million collected in taxes on behalf of the Palestinian Authority in an apparent response to the Palestinian UN-bid. On Sunday Netanyahu clarified his stance on building new settlements, stating that the Israeli government gave the green light to zoning and planning, but not construction in East Jerusalem. “We will carry on building in Jerusalem and in all the places that are on the map of Israel’s strategic interests,” Netanyahu said. This move meant to signal to the Palestinians that if they continue unilateral actions, such as the one with the UN-bid Thursday, Israel would move forward with actually building the settlements, Jerusalem Post reported. But the settler population isn’t convinced that Netanyahu will follow through with his plans. “The settler population does not believe that Israeli Prime Minister Benjamin Netanyahu will go ahead with building these units. They believe it’s almost a cheap move by Netanyahu to try to gain support ahead of January’s elections and that this is an internal matter to try to build votes,” RT correspondent Paula Slier, who is in Tel Aviv, reported. The construction of the new settlements in the E1 area connecting the Israeli settlement Ma’aleh Adumim and Jerusalem could become a big obstacle for the future any Palestinian state as it would prevent territorial contiguity between the northern and southern West Bank.